It was like the old joke about the elephant wearing sunglasses because he didn’t want to be recognised. Tiger Woods, wearing shades between shots to protect his eyes from the pollen, is perfectly placed to make a weekend charge for his fifth green jacket and 15th major title after carding three birdies and a bogey in a second round 70. “When he walks into that locker room or dining area for the first time, it’s going to be like there’s a giant elephant in the room,” Stewart Cink said of Woods’ comeback. At six under par, Woods is very much the elephant on the leaderboard, just two strokes adrift of clubhouse leader Ian Poulter, who carded a second successive 68 to set the target at eight under par. Tied with KJ Choi (71), and former US Amateur champion Ricky Barnes (70), Woods was asked how his performance stacked up against his expectations so far. 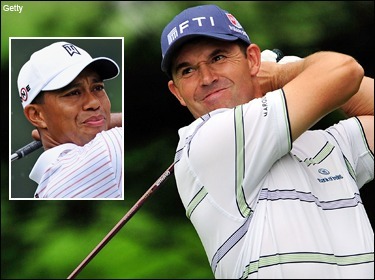 “Well, I want to be in contention, and put myself right there,” Woods said. “As of now, I’m two back, and we’ve got 36 more holes to go. England’s Lee Westwood proved the point by racing to 10 under par through 13 holes of his round - five under for the day - before a double bogey six at the viciously sloping 14th relegated him to eight under with four holes to play. Poulter was hoping that his Ryder Cup team mate would hang on to ensure an all English final two ball today. Either way, he was delighted to survive a tough day at a cool and breezy Augusta, where the green jackets hit the pins in the remotest corners of the greens. Poulter rubs many people up the wrong way but you have to admire the sheer tenacity of the 34-year old Englishman who grabbed the clubhouse lead on eight under par thanks to a second successive 68. “I’ll tell you what, five under par is a very impressive performance by Ian Poulter,” Padraig Harringtons said as he surveyed the leaderboard. Poulter would bogey the last to shoot a four under par round but Harrington put his performance in perspective after a windy day on a terrifying course with pins cut just three and four yards from the edges of most greens. Poulter sold Mars bars when he became a humble assistant with a four handicap in 1994 but has since become a marketing genius as well as one of the best players in the world. That’s now a real possibility. Victory over Paul Casey in the WGC - Accenture Match Play Championship in February saw him leap to a career high of fifth in the world. It also added to his already bullet-proof confidence and he he is now just one major win away from becoming world No 2. Labelled a preening peacock at times, his colourful dress sense is not to everyone’s taste but when asked what colour outfit might match a green jacket, he showed that he has a keen sense of humour. Fred Couples is bidding to become the oldest winner of the Masters since a 46 year old Jack Nicklaus triumphed in 1986. But the 50 year old overnight leader was suffering from a bad back yesterday and faltered, three putting the 16th and 17th and then overshooting the 18th to finish with a confidence sapping hat-trick of bogeys and a 75 that left him five strokes adrift of Poulter on three under par. “Yesterday was a great day,” said the 1992 champion. “Today was not too good, 75 is a very mediocre score. But I’m done. “For a while I felt like I could go from first to last. But I kind of loosened it up and got it around. The (second) shot on nine really killed me - a downhill lie, and those don’t feel good on regular days. Today that kind of threw me for a loop. Tiger Woods needed five stitches in his lip and treatment for a sore neck after the November 27 car crash that caused his world to come tumbling down around his ears. Just 18 weeks later he sat before the 207 selected media bruisers for what was modestly termed the 2 o’clock interview by the men who run Augusta National and walked away without so much as a scratch. Talk about float like a butterfly. There was no escaping Tiger Woods in Augusta yesterday. Turn on the TV, there was Woods in his latest Nike commercial, staring at the camera in black and white as the disembodied voice of his father appeared to be address him from beyond the grave. 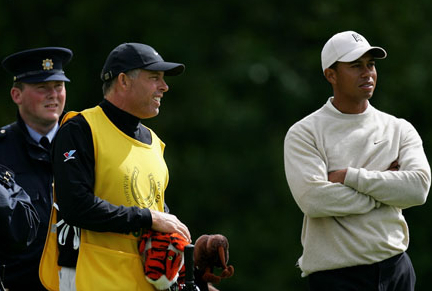 Who knows what Tiger has learned recently. As for us, we learned that he really is a superhuman golfer after all as he carded a brilliant, four under par 68 to sit just two shots behind leader Fred Couples after and enthralling opening day at the Masters.